So, fun fact. 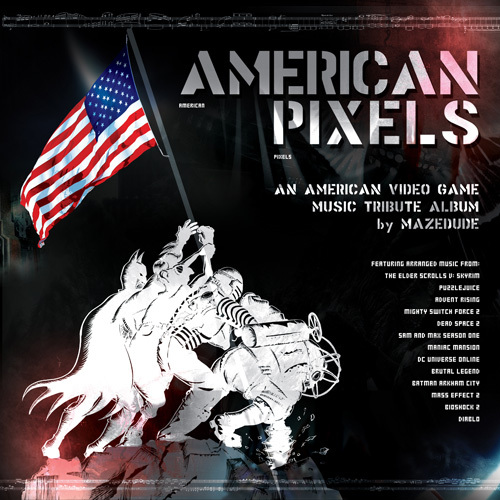 This track was not on the original tentative track list I put together when I first announced American Pixels. I hadn't played the game, I was specifically targeting new (as in, they weren't represented on the first American Album) composers to be honored, and I already had quite a long list of compositions to arrange. But... for fun, I put a little request box on the website, so that I could be notified any of fan favorites, composers I should keep an eye out for, etc. And a lot of people wrote in, actually—if you're one of those contributors, yes, I read the e-mails I appreciate them! But yeah, one of the requests was for the main theme from The Elder Scrolls V: Skyrim. I'd heard about the game (although I'd resisted buying it... I was worried about getting sucked in, heh), but I hadn't heard the music. So I listened to the main theme. And... yeah, it was big, it was epic, it had full orchestra and choir... which already is usually an indicator that it's not going to be terribly easy to remix, heh... but I was intrigued. So the next question was... who is the composer? None other than Jeremy Soule. Now, I'd already honored Mr. Soule with a Secret of Evermore remix on the first album, via my stylistic homage to the K-Pax soundtrack by Edward Shearmur. As he wasn't yet on the list of composers, I gave it some thought... and added him. And then... I went out and got the game. And yep. It happened. I got sucked in. I can probably even say this album may have been finished sooner if I hadn't gotten lost in Skyrim, but... ah well. So then, there's the decision of how the heck to arrange this piece. It's already got a full orchestra, a choir... I can't compete with that with my humble tracker! But ah... what I can do is to go backwards with it. Hello, square waves! Let's make a 9-bit chiptune out of this. Boom. The rest is history. I developed a routine where I would chip away this track a little each morning before starting my work day (it took a while), and eventually, we had it. And now, it's the headlining track on the CD; not only do I feel that it encapsulates the idea of the album in a single track, but it features a solid performance by a talented friend, and darn it, that's a nice theme! PS - I gotta give a major shout-out to Dhsu for this. When I first sent him the sheet music, he practiced, got it pretty solid, and sent me a recording using the best synth piano he had around. There was a pretty huge gap between that time and the time when I finally took the layers to Subcat Studios, and lo and behold... we just couldn't get it to mix right. The synth piano didn't mix with the electronics. So with literally a week before the mastering date, I asked Dhsu if we could re-do the whole thing... on a real piano. This meant more rehearsal, finding and booking a studio, and recording all over again, with very little time to do it all. Without hesitation, he found a studio there in Tulsa, dusted off the sheet music, practiced, went back in, and NAILED IT. With like, a day to spare, I worked it into the mix, and the next day took it to the studio. It worked perfectly, and beautifully. In the end, what might have been a less-than-ideal start to the album - due to technical concerns - turned around into an amazing track, largely in part to the dedication and perseverance of David Hsu. I owe you man. Thanks a ton.